An all-inclusive literature search in the most popular research databases was done using deglutition, feeding, swallowing, dysphagia, nutrition, and India as search words. These keywords were selected by the researcher in consultation with senior experts and peer groups to include a maximum number of reports that contain any information related to the subject. These databases included both national (IndMed, ISHA Research, and Institutional databases) and international (Turning research into practice, PubMed, Google Scholar, and Medline) collection of research reports. Attempts were made to include Scopus, LILACS, SciELO, and Cape Journals but could not be included due to technical limitations. An additional search of in-house publications of speech and hearing institutes approved by the Rehabilitation Council of India (RCI) was also conducted for the identification of relevant literature. It may be noted that research papers presented at various national and international conference and those published in proceedings of events were not retrieved in this study. Only, the research reports that were published in a journal were considered for inclusion as these are the first and most reliable sources of literature information for any researcher. Details of these reports would provide insight into the contribution of Indian research on dysphagia at a global level. [Figure 1] provides a depiction of the procedure followed for the identification of relevant articles. Did not aim at studying dysphagia but rather the cause or other related attributes. Affiliation: The name of the setup was tabulated after which they were classified into medical hospitals/private clinics/academic institutes. 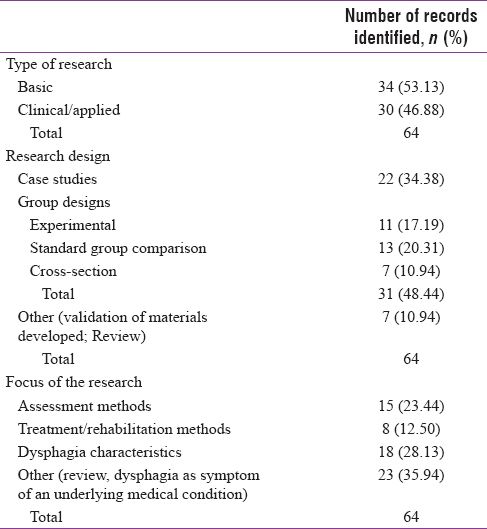 The results of web search on most popular database identified only 64 articles reported from India by Indian Researchers that specifically studied dysphagia or its rehabilitation. [Table 1] summarizes the number of articles identified in this area from various sources explored. Majority of relevant Indian reports could be retrieved from Google Scholar. 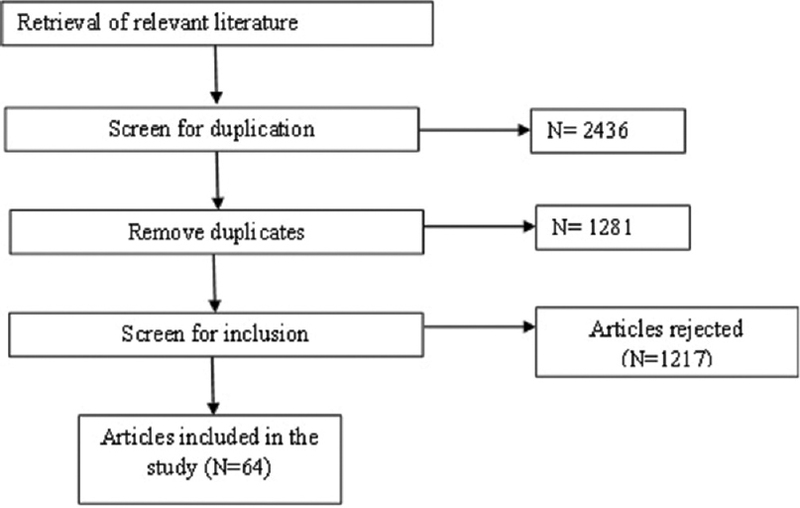 However, the author would like to mention here that PubMed search also retrieved similar results but is not represented here as the reports were duplicates of that retrieved from Google Scholar. Since these duplicates were removed during screening [Figure 1], the same is not represented in [Table 1]. The second most reliable source for Indian research reports on dysphagia is the in-house documentations available from specific institute websites indicating that many researchers have not published their studies on the global library. From [Table 2], about half of the dysphagia research is reported by medical professionals that include specialized personnel in the field of Neurology, Gastro-Enterology, Oto-Rhino-Laryngology, and Pediatrics followed by speech-language pathologists. Dysphagia being a multidisciplinary field requires the team efforts of many medical and allied health professionals. It is unfortunate that there is a lack of collaborative work among the professionals who are frequently involved in dysphagia rehabilitation. It may be related to the weaker establishment of the field of dysphagia in this country. [Figure 2] and [Table 3] summarize the geographical locations from which the research reports have originated in India. The state of Karnataka houses 14 institutes approved by the RCI that offers graduate and postgraduate courses in speech and hearing and also has 2346 primary health centers. Government health policy, such as the Karnataka State Integrated Health Policy, has recognized nutrition as an essential aspect of health and paved the way for dysphagia rehabilitation and research to develop in the state. The state of Maharashtra follows Karnataka with five RCI recognized speech and hearing colleges and approximately 34,000 hospitals (as of 2001). Most of the speech and hearing institutes in Karnataka are linked with medical hospitals providing them ample opportunities for delivering dysphagia rehabilitation, which may be a probable reason for the higher number of research outputs from the state of Karnataka. In general, the Southern part of the country (States of Karnataka, Kerala, Tamil Nadu, and Andhra Pradesh) is currently witnessing the growth in the field of dysphagia while dysphagia research is neglected in the Western and Northeastern parts of India. This is in spite of emphasizing placed on nutrition by the National Health Mission, Government of India. The reason for this may be the relatively weaker awareness, lack of expertise, or misplaced focus of the health mission. Characteristics of research were categorized into various aspects such as clinical or basic research, research designs used, and also the focus of research reported. The descriptive summary of these classifications and the number of included research reports are provided in [Table 4]. There are both basic and applied types of research reported from the country with standard group comparisons as the most common design. Many studies are published based on the unusual presentation of dysphagia which is reported in the form of case studies. 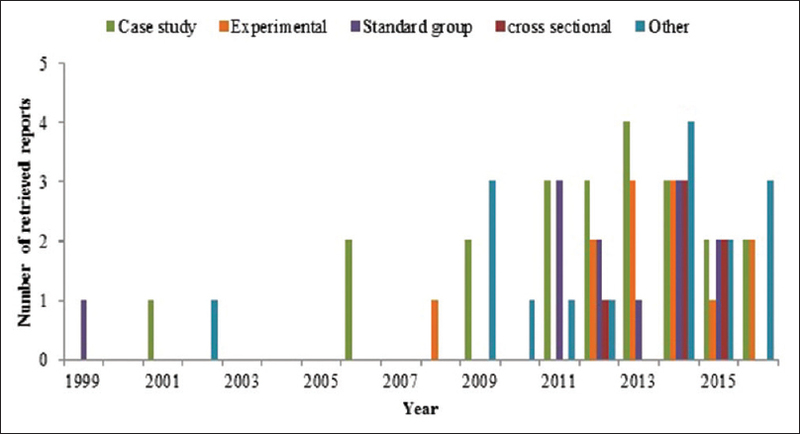 A limited number of studies have attempted to explore the measures of swallow across a cross-sectional group of the population, and very few experimental studies on swallowing are reported from India. Few attempts toward the development of assessment, treatment, and quality of life tools can be found in the literature. These tools are mostly developed for in-house use, remain unpublished and are targeted to specific professionals and patients. Few National Journals lacked information on updated impact factor, due to which all the reports considered for other sections could not be included in this analysis. Indian researchers are aiming at international and national publications and have successfully published nearly 75% of their work in national and international forums. However, unfortunately, a decent number of works remain unpublished in the in-house repository of the academic institution without marking its impact on the global literature. The reports available are published in good international journals with high-impact factor [Table 5] suggesting acceptance and encouragement of many researchers across the world, and quality of work that has been carried out in India, though limited in number. Few other reports are available in Indian journals that have a lesser impact factor, probably due to limited coverage, availability, and distribution of the journal for reference and citations by other researchers. This is also in concordance with the number of citations made for these Indian research reports by other researchers globally. 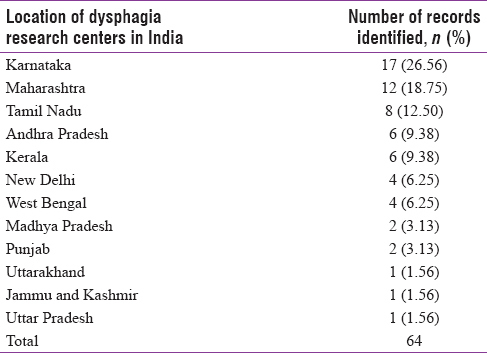 As calculated from the “Google Scholar” statistics, Indian research in dysphagia published in international journals has received citations 6-folds more than national publications [Table 5]. It may be noticed, that this statistics is only based on “Google Scholar.” There may be high demand for Indian literature in dysphagia if the unpublished works are made available for other interested professionals rather than documenting the same in the in-house repositories. From the data derived from this review, the dysphagia literature originating in India could be divided into two eras as follows: before 2008 and after 2008. 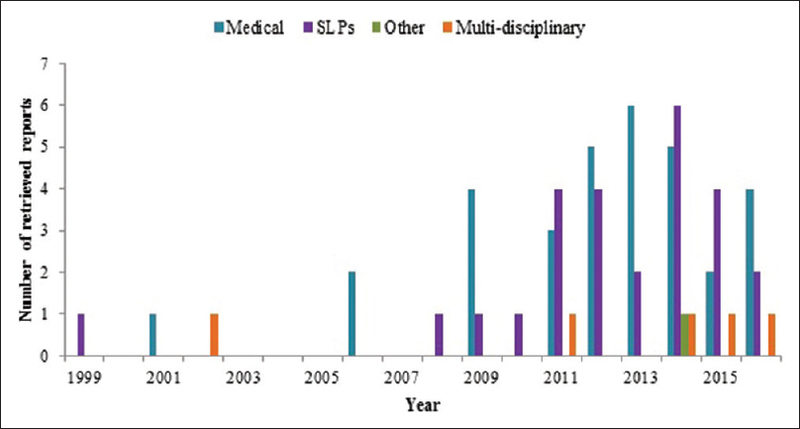 The year 2008 seemed to be the igniting year for dysphagia research in India as there was a constant increase in published and unpublished literature from the country. All changes in this study are analyzed in these two eras of Indian literature. The investigated characteristics of these reports across years are presented in [Figure 3], [Figure 4], [Figure 5], [Figure 6], [Figure 7], [Figure 8]. The first report from India appeared in literature in the year 1999, and then there were random appearances in national and international journals [Figure 3]. 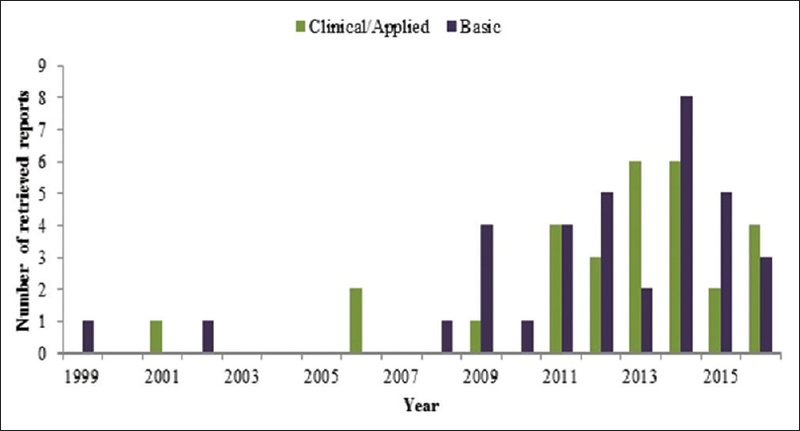 Since the year 2008, there has been an increasing number of researches reported in the literature. 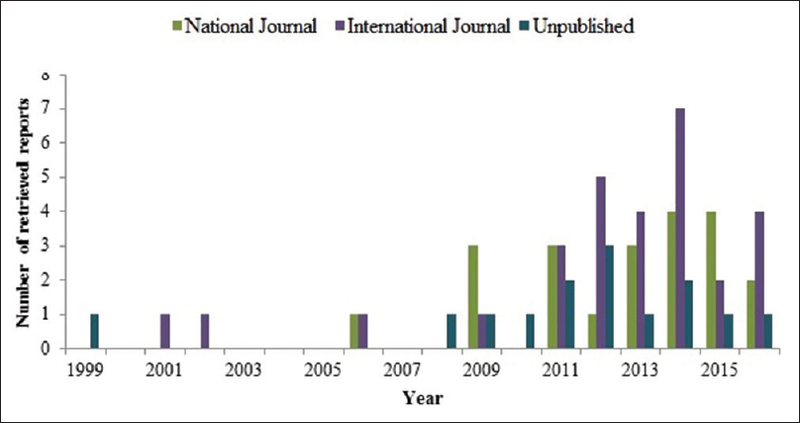 The number of international publications has been increasing since 2008 and so is the unpublished literature. However, the trend of unpublished literature has been changing for good, and some researchers are making their work available globally. Parkinson J. An Essay on the Shaking Palsy. USA: Create Space Independent Publishing Platform; 1817. Larsen GL. Rehabilitation for dysphagia paralytica. J Speech Hear Disord 1972;37:187-94. The Karnataka State Integrated Health Policy; 2001. Available from: http://www.karnataka.gov.in/..../karnataka-state-integrated-health-policy-2001.pdf. [Last accessed on 2017 May 05]. Chatterji S, Kowal P, Mathers C, Naidoo N, Verdes E, Smith JP, et al. The health of aging populations in China and India. Health Aff (Millwood) 2008;27:1052-63. United Nations Population Division (UN). World Population Prospects: The 2010 Revision. New York: United Nations; 2011. Available from: http://www.esa.un.org/unpd/wpp/index.htm. [Last accessed on 2017 May 05]. Kawashima K, Motohashi Y, Fujishima I. Prevalence of dysphagia among community-dwelling elderly individuals as estimated using a questionnaire for dysphagia screening. 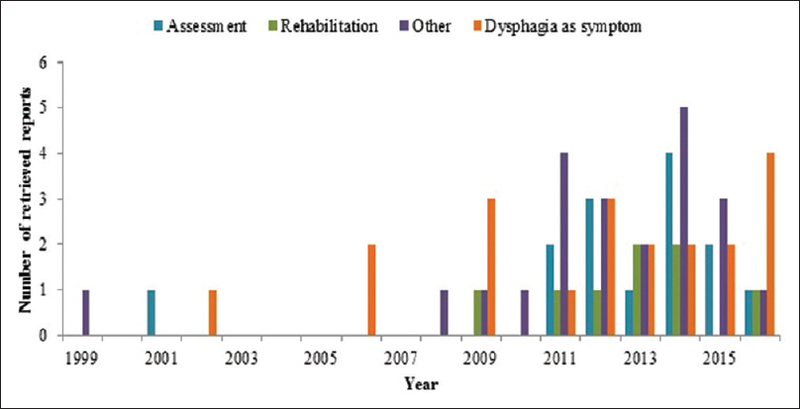 Dysphagia 2004;19:266-71. Serra-Prat M, Hinojosa G, López D, Juan M, Fabré E, Voss DS, et al. Prevalence of oropharyngeal dysphagia and impaired safety and efficacy of swallow in independently living older persons. J Am Geriatr Soc 2011;59:186-7.